Black winter trees now reach skyward. dark-winter earth, of what else they saw. Behind the hill is a storm-cloud. lovers who ran from clapping thunder? is behind the winter trees. haunt with beauty not the facts. 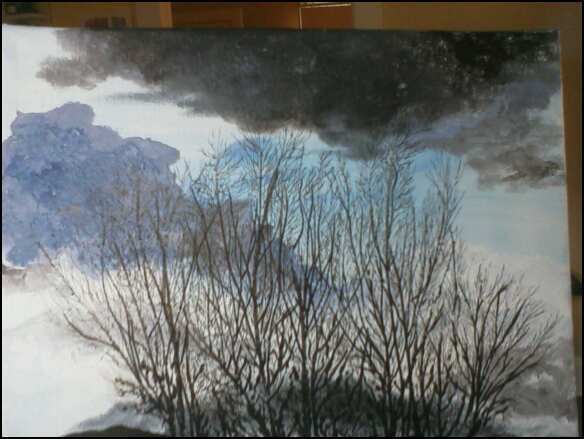 Author comment: I was attracted to the painting because I find times when the trees are black silhouettes to have a strong spiritual pull. I added a back story to make the poem more than just a description. I added some details that are not in the painting, but I wanted to leave parts of what happened last summer to the imagination of the reader. We know only the present. We don’t know for sure that the clouds will bring a storm, and we know little about the lovers. As a reader speculates and adds details to what is seen or said, he can add to the story, but only the trees know for sure, and the trees aren’t talking. Bio: Helen Losse is the author of four collections of poems, including Seriously Dangerous (Main Street Rag, 2011) and Better With Friends (Rank Stranger Press, 2009) and the Poetry Editor for the online literary magazine The Dead Mule School of Southern Literature. Her recent poetry publications and acceptances include Main Street Rag, Iodine Poetry Review, Willows Wept Review, Referential, The Pedestal Magazine, ken*again, Hobble Creek Review, and Literary Trails of the North Carolina Piedmont. I especially like this, Helen. I’m at work currently on a collection of poems about trees, complete with photos, so I can resonate easily with what you have done here — but so much better than I could have! Thanks for this fine commentary on the tree and what it reveals.